Boulder, Colorado — Babolat, the official racquet and string partner of Rafael Nadal, congratulates Rafa on becoming the new World No. 1 tennis player. After nearly 160 weeks (since July 25, 2005) at No. 2, Nadal becomes the third Spaniard to reach the top spot in the men’s rankings. With 4 back-to-back French Open titles, a Wimbledon Championship and an Olympic Gold Medal, Nadal’s accomplishments rival those of the greatest names in tennis. Earlier this year, he became the first man since Bjorn Borg in 1980 to win Wimbledon on the heels of a French Open victory. Dubbed the “King of Clay,” Nadal achieved an Open Era record 60-match clay court winning streak back in 2006, surpassing Guillermo Vilas’ mark of 53 in 1977. Since his days as a young player, Rafael Nadal has played with a Babolat racquet and strings. Just last year, he agreed to an extended contract with the premiere French tennis brand for another 10 years. Nadal’s stick is the Aeropro Drive, developed by Babolat with Aero Modular technology to suit Nadal’s game. The aerodynamic design provides for increased racquet head speed with unmatched topspin. The Aeropro Drive is one of the hottest selling racquets in the US today. The aerodynamic profile provides for maximum power while the Cortex System offers an optimized feel of the ball at impact. This Cortex technology filters unnecessary vibrations, keeping only those that players are looking for when the ball comes in contact with the racquet. 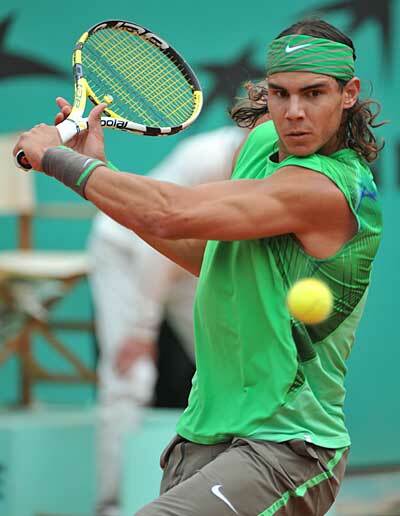 NEW - Coming September 2008, a full line of “Nadal Junior” racquets. Nadal uses Babolat Pro Hurricane Tour for his entire string bed. Pro Hurricane Tour is a co-polymer monofilament string featuring an octagonal profile engineered for maximum spin and power, with exceptional durability. Founded in Lyon, France, in 1875, Babolat is the first company to have specialized in racquet sports and the world leader in the production of natural gut strings. Easily recognized by its trademark “double-line” (two stripes on the racquet frame and black on the stringing bed), Babolat is still family-owned. Today, with U.S. operations in Boulder, Colorado, the company also manufactures synthetic strings, shoes, and a full range of accessories as well as a best-selling line of racquets used by some of the most renowned names in tennis. To find out where Babolat products are sold, log on to babolat.com or call (877) 316-9435.